Since olden times, feathers have been collected for magickal uses. 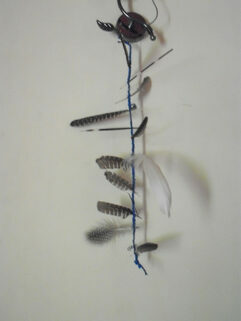 One of the most famous charms using feathers is the Witches Ladder. To make a Witches Ladder, three different coloured yarns are braided together, the colours depending on the purpose of the spell. Nine feathers are worked into the braid. Feather colours will depend on the type of magick you are working. The magickal qualities of feathers are determined by their colour, and sometimes by the birds from which they fell. Listed below is feather lore from European folk magick sources. You'll find it differs slightly from that of colour symbolism in general. Found feathers are best. Walk in the wild, keeping your eyes open for these treasures. WHITE - White feathers symbolize purification, spirituality, hope, protection, peace, and blessings of the Moon. RED - Red feathers symbolize physical vitality, courage, good fortune, and life. BLUE - Blue feathers symbolize mental abilities, peace, protection. And psychic awareness. YELLOW - Yellow feathers bring cheerfulness, mental alertness, prosperity, and blessings from the Sun. GREEN - Green feathers symbolize money, prosperity, growth, health, and fertility. Green and red mixed feathers affect financial matters. ORANGE - Orange feathers bring attraction, energy, and success. PINK - Pink feathers attract love. GRAY - Gray feathers symbolize peace and neutrality. BROWN - Brown feathers give stability and respect. They also symbolize the home and grounding. BLACK - Black feathers give the mystical wisdom that comes with true spiritual initiation. PEACOCK FEATHERS - The "eye" on the end of the peacock tail feather protect against the "evil eye" and stimulates inner clairvoyant vision. ROOSTER FEATHERS - The rooster's two prominent tail feathers (called sickles) are symbols of the God and Goddess. Assemble materials. Cast circle or create sacred space. Light a candle in a colour corresponding to your magickal working. (Blue for peace, etc.) Burn incense which corresponds to your purpose. Have a small bowl of salt and a small bowl of water at your work space. Work your magick spell this night. Protection (or peace, etc) this charm will bring. Hang the witch’s ladder high in your house where it will not be seen by others, but where you can see it everyday.